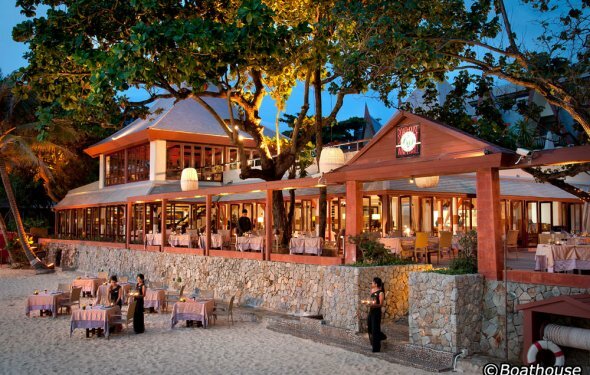 Location This luxurious boutique hotel is located directly on the beautiful Kata beach. It is 45 km by car from Phuket Airport to the hotel. Facilities This hotel was built in 1988. The establishment offers travellers a total of 36 rooms. Most storeys are accessible by lift. Services such as a safe and a currency exchange service ensure a comfortable stay. Wireless internet access is available to guests in the public areas. Various gastronomic options are available, including a restaurant, a dining area, a breakfast room and a bar. Those arriving in their own vehicles can leave them in the car park of the accommodation. Additional services include a babysitting service, translation services, room service and a laundry service. Rooms The hotel features rooms with air conditioning, a kitchen and a bathroom. The standard amenities of most rooms include a balcony. Many rooms feature a sea view, which further enhances the ambience. The carpeted rooms feature a double bed or a king-size bed. Cots are available for younger travellers. A safe, a minibar and a desk are also available. A fridge, a mini fridge and a tea/coffee station are provided as standard. Internet access, a telephone, a TV, a radio, a stereo system, a DVD player and WiFi add to the comfort of the holiday. The daily newspaper is laid out for guests in the the rooms. The bathrooms are fitted with a shower, a bathtub and a hot tub. A hairdryer and bathrobes are provided for everyday use. Sports/Entertainment The establishment features various options for cooling off on hot days, including a pool and an outdoor pool. The hot tub is the perfect place to relax. Those who wish to enjoy sports and leisure options during their holidays can take advantage of the on-site windsurfing, snorkelling, a spa and massage treatments, or for a fee, a gym. In addition, a gym is offered by third-party operators. Fun and entertainment are offered by a nightclub. Meals Guests can choose from a range of snacks and meals including breakfast, lunch or dinner. Payment The following credit cards are accepted at the accommodation: American Express, VISA, Diners Club and MasterCard.